Who says sandwiches have to be limited to lunchmeat or PB&J? These flavorful and innovative sandwiches are easy to prepare but big on flavor. They’re sure to spice up your brown bag lunch or add some pizzazz at dinnertime! If you’re wanting to try some creative alternatives to normal lunchtime sandwiches or pique your family’s interest at the dinner table, these are the perfect sandwiches to try! 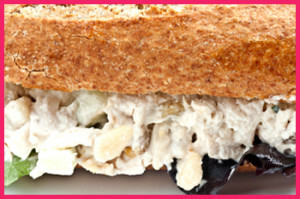 For a yummy and healthy sandwich to take to work, try a cashew chicken salad sandwich! In a large bowl, combine 2 cups cooked, cubed chicken, ½ cup salted cashews, ½ cup chopped celery, and ½ cup drained mandarin oranges. In a small bowl, combine ½ cup mayonnaise, ½ teaspoon sugar, ½ teaspoon salt, and a dash of pepper. Add to chicken mixture and toss to coat. To serve, spread about ½ cup chicken salad on a croissant or dinner roll. Top with sliced tomatoes or lettuce leaves, if desired. Eat some chopped vegetables and fresh fruits alongside for a tasty and healthy meal! Check out Real Simple for more healthy yet hearty sandwich options. Whether you’re a vegetarian or just someone who enjoys trying new recipes, these flavor-packed sandwiches are a delicious change-of-pace! Try this delicious and healthy sandwich from Big Girls Small Kitchen if you’re looking for something stellar to add to your Meatless Monday roster. In a large mixing bowl, combine 2 medium peeled, cubed eggplant, 2 medium cubed red onions, ¼ cup olive oil, and 1 teaspoon salt. Turn out onto a parchment or foil-lined baking sheet. Use a spatula to turn the vegetables over so they will brown on the other side. Return to the oven for another 10-20 minutes, until the vegetables are brown and caramelized. Place the vegetables in a bowl and toss with1/2 of a juiced lemon and 2 tablespoons chives. Place the vegetables on slices of sourdough or white bread, and add white bean spread dip. Check out other vegetarian sandwich options for something low on fat but big on flavor. These easy-to-make wraps are filled with barbecue chicken and cheddar goodness. They’re great to fix for kids on a school night or make to take to work for lunch. To create the wraps, put a little olive oil into a medium skillet over medium heat. Throw in four handfuls of fresh spinach or other greens, and cook until the greens are wilted (2-5 minutes, depending on the type). Remove to a bowl and use a paper towel to squeeze out the oil so that your wrap isn’t soggy. Place 2 white or wheat wraps or tortillas on 2 separate plates and microwave for 10 seconds or until pliable. If desired, spread a little mayonnaise or mustard in the middle of each. Place 1/3 cup cooked, chopped chicken on each wrap, and then drizzle with barbecue sauce. Sprinkle ¼ cup shredded cheddar cheese on each wrap. Wrap up, tucking in the sides. Turn the skillet to medium-low and place one wrap in the pan, seam side down. Cook for 5 minutes or until browned, making sure that it doesn’t burn. Flip to the other side and cook for additional 4-5 minutes or until browned. Repeat with the second wrap. Cut each wrap in half and serve. 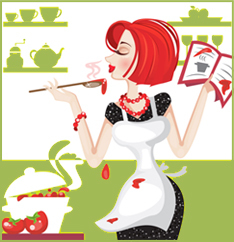 Kendra Smithi is a food blogger who enjoys trying and creating new recipes.